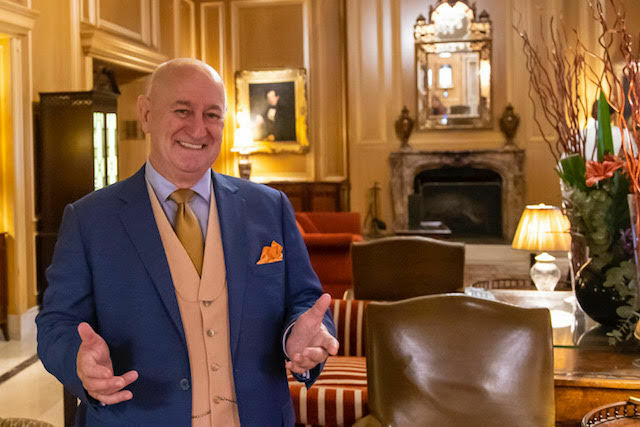 Every weekend in Sydney, Bruce Glen, The Gentleman Magician, presents an entrancing evening of magic and captivating Australian stories at Sir Stamford at Circular Quay - one of Sydney's most beautiful historic buildings. Experience a truly magical evening with Bruce Glen, an Associate of the Inner Magic Circle - the most exclusive magic club on earth (with just 1400 members worldwide). This honour is reserved for those who achieve a high level of excellence in their art. During his career, Bruce has performed to sold-out houses at the Edinburgh Fringe; the Adelaide Fringe; Fringe World Perth; the famous Edinburgh Magic Festival; and Sydney's SMH Spectrum Now Festival. He also presented sophisticated 'storytelling magic for adults' at The Swifts, Darling Point; The Hughenden Boutique Hotel, Woollahra; Ayers House Museum, Adelaide; and Old Government House, Parramatta. At The Gentleman Magician's Magical Soiree, Bruce Glen treats his guests to an intimate and entertaining performance, reminiscent of the elegant, captivating events of the famous 'salons' in 19th century Europe. This regular Sydney attraction recreates the ambience and enchantment of a 19th Century Viennese salon and spectators will enjoy a stylish, intriguing event that will be remembered for years to come. This is a rare opportunity to discover Sir Stamford's rich history, hear entertaining stories about early Sydney town and witness a world-class magic show. The Gentleman Magician's Magical Soiree takes place every Friday and Saturday at approximately 7.03pm at Sir Stamford at Circular Quay, 93 Macquarie Street, Sydney (Cnr Albert Street). Tickets are priced $75 per person and include champagne and canapes on arrival. Please note this event is for ages 12 and over only. Bookings are essential: please visit www.GentlemanMagician.com.au to purchase tickets or for more information. If you have an enquiry, please call 1300 033 599. Dress Code: 'Dress to impress' for a very special experience. (Smart Casual / Cocktail Dress). Please note this event is for ages 12 and over. Such a wonderful show, I absolutely loved it! The Gentleman Magician's Magical Soiree was one of the best night's entertainment I have ever had....ever!!! Clever, mind boggling, funny and totally entertaining. The venue is out of this world. Well worth the investment of both time and money.